Digital transformation require a paradigm shift in storage. NVMestorage delivers cutting edge data solutions that integrate seamlessly in to your current datacenter and responds to todays changing business requirements. All roadblocks are eliminated in terms of complexity, costs, capacities, power and bandwidth. Private connectivity to the data per application isolates data processing and prevents neighbour noise. 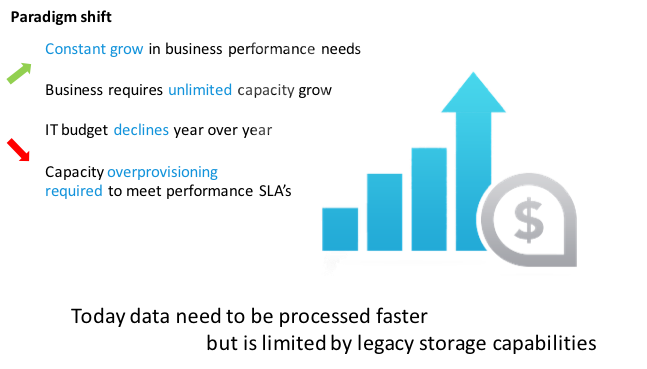 Integrates easily in existing datacenter environments at less than $0.3 per GB/month. Today’s storage array’s will disappear completely. The traditional performance differentiator is no longer on IOPS, Capacity and Data services and next gen storage devices will be decoupled. Storage Area Networks will be convert to direct attached and compute scaled architectures. Traditional IT sales blocks innovation for customers and IT procurement will move to online orientation and purchasing. That’s why we believe that tomorrow’s storage, needs to be investigate, compared and purchased differently. NVMestorage delivers a new modern data architecture solution that integrate seamlessly and expand your current infrastructure one node at a time to reduce overprovisioning. All roadblocks are eliminated as application servers independently scale from storage resources to match workload demands and improve efficiency without centralized and performance consuming in relevant functionalities.